Sooper Brings Junoon Live in Concert on the 25th of December! After the successful reunion of Pakistan's most legendary band, Junoon, Peek Freans Sooper is now bringing the Sufi maestros live on 25th December 2018. The announcement was made with nearly 500 musicians coming together to pay tribute to Junoon and help revive the spirit of Pakistan through their music. The concert is expected to be the biggest performance in Pakistan’s history. Even though news of Junoon’s reunion was met with massive fanfare, many people still wanted to see Junoon perform live. Sooper has made that possible in perhaps the grandest way possible. By bringing the country's most loved sufi rock band back to the limelight, the brand is giving their fans to witness history in the making. The venue for what is expected to be the event of the year is the Airmen Golf Club. Tickets to the concert have already been made available at www.yayvo.com/sooperjunoon. Fans will get the chance to benefit from an early bird discount as tickets will be sold on a first-come, first-serve basis. 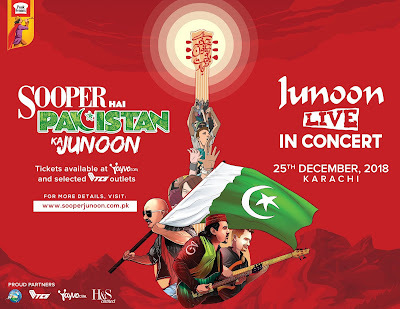 Additional information of the concert can be found on the brand's website: www.sooperjunoon.com.pk.